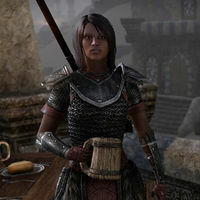 Akhita is a Redguard member of the Fighters Guild. She can be found at Baandari Trading Post, Bergama and Windhelm. "Welcome to the hall, comrade! I bet you've got some good tales to tell of our war on the Anchors." Actually I'm here to ask about the former Guildmaster. Did you ever see Jofnir here? "Sure of course. had me set out some supplies for him a few times. He said he was going out yo Ragnthar, that weird old Dwemer ruin. I kept telling him the Mages had already emptied it out, but he kept telling me he needed to go." What was that about the Mages Guild? "Oh, studying it and such. Ragnthar is … weird. Unique, I guess you'd say. See, nobody really knows where it is. Physically, that is. It has an entrance near here, right? But the Mages say stepping through the door is some kind of … uhh." "Tempo… Temporospatial Claudication. I think that's what they call it. Anyway, it means the ruins inside are all scooped out of time and space. There are entrances to the place all over Tamriel. But nobody knows where it really is." Did he tell you why he was going out there? "He said he was meeting someone. That he had to meet with them somewhere safe. That what they were talking about was very important. Guess that's why Jofnir went to the trouble of going to that weird old place." This page was last modified on 23 January 2019, at 03:00.